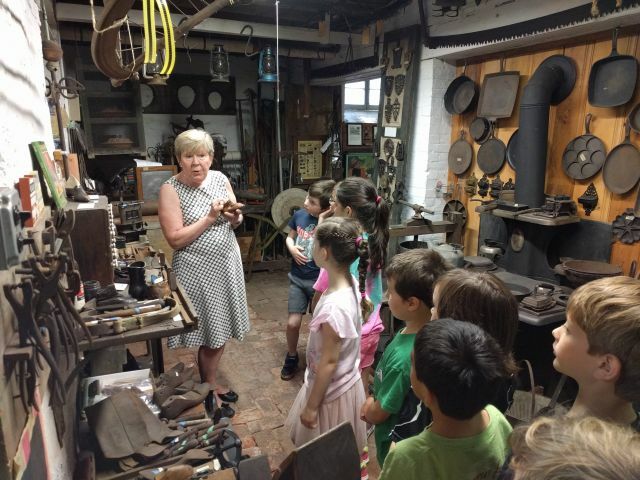 With springtime upon us, it’s time to start planning for our annual school tours for Haddonfield elementary school students. We’d love your help either as a lead docent or a helper — all training will be provided! Volunteers should be willing to commit to at least two school tours of Greenfield Hall on weekday mornings in April or May. We’ll be holding a meeting for new and returning docents at Greenfield Hall on Friday March 22 at 1 pm. Please RSVP to Marsha Marshall at info@haddonfieldhistory.org or by calling the Historical Society at 856-429-7375. Of course, if you’re interested in volunteering but can’t attend training on the 22nd, please let us know that too. Questions? Contact the Historical Society at 856-429-7375. Tickets are only $25 per person, and space is limited to no more than 40 participants (in two groups of 20). 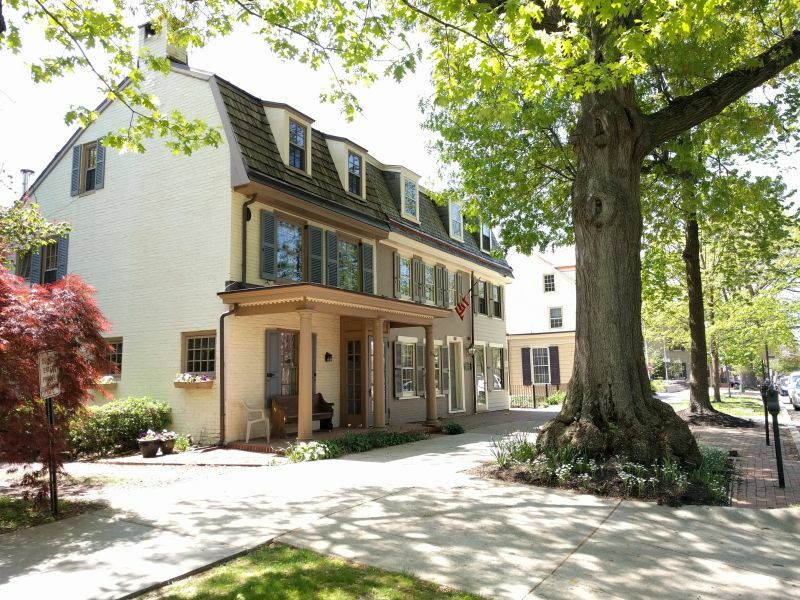 The walking tour will be led by Joe Haro, who has for many years led architectural walking tours in Philadelphia and Haddonfield, and Co-Borough Historian Kathy Tassini. 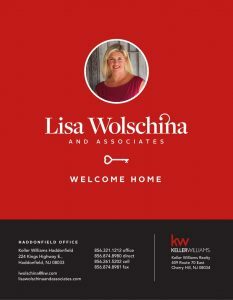 The tour will depart from Greenfield Hall, 343 Kings Highway East, Haddonfield, and continue to Haddon Avenue and back. Participants will have a chance to view the inside of the Guard House / Timothy Matlack house on Kings Highway, opposite the Indian King Tavern. Light refreshments will be available at Greenfield Hall after the tour. All proceeds to benefit the Historical Society. Contact the office at 856-429-7375 or by email at info@haddonfieldhistory.org to get your tickets today. 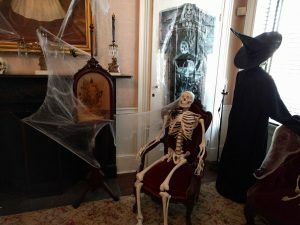 The Historical Society of Haddonfield’s annual Haunted Mansion at Greenfield Hall will be held on October 30 right after the town Halloween parade, approximately at 7 pm and continuing to 9 pm. The cost is $3 for kids and $5 for adults, and tickets will be sold at the door. For those who haven’t visited the Haunted Mansion before, we aim to make this event appropriate for elementary school aged kids, roughly second to fifth grades. We add seasonal decorations to the first floor of Greenfield Hall and offer lights-out spooky tours. Light refreshments are served in the back garden. This year, we’ll also be offering spooky story time in the back garden for younger visitors who aren’t sure about taking the inside tour. 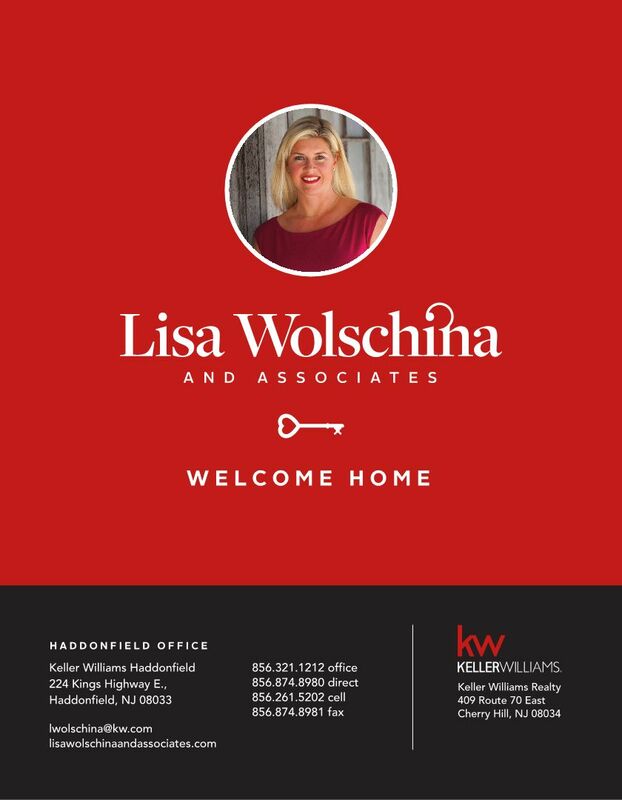 This year’s event is sponsored by Lisa Wolschina and Associates from Keller Williams Realty and Jason Barnes from Citizens Bank. Tickets are $10 for adults and $5 for kids under 12. 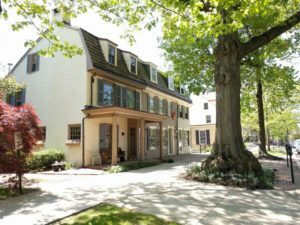 The tours benefit the Historical Society and the Haddonfield Public Library. The tour lasts about 60 minutes and starts at Greenfield Hall before winding past the cemetery and familiar homes in town. 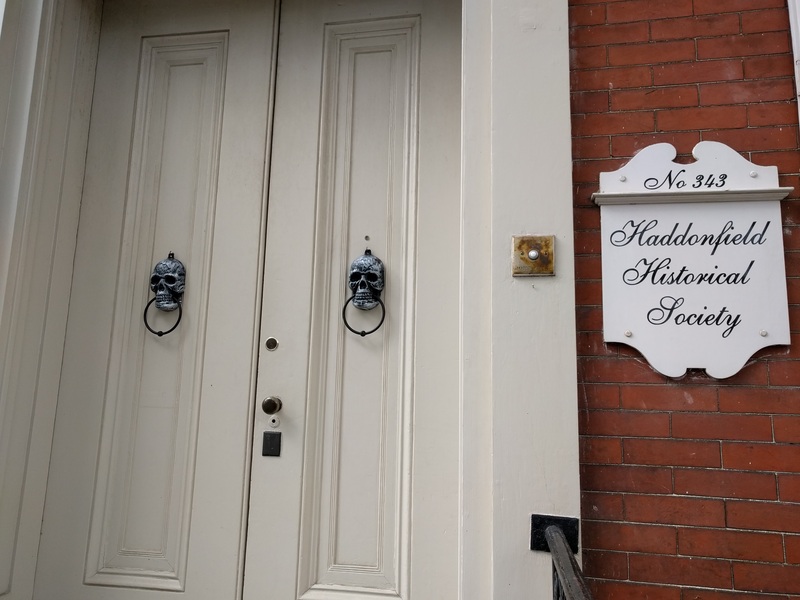 Tickets may be purchased at the door as space allows (cash only) or purchased in advance at the Historical Society during open hours, at the Haddonfield Public Library, and at the Haddonfield Visitors Center. Please remember to wear comfortable walking shoes, bring a flashlight, and wear light/reflective clothing as a safety precaution. Groups of 15 or more should contact the office. Occasional private tours may be available for a group rate. Questions? Contact the Historical Society at 856-429-7375 or info@haddonfieldhistory.org. 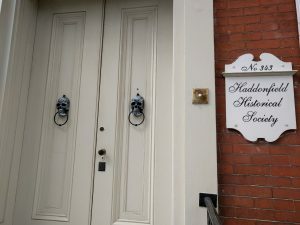 This spring, the Historical Society of Haddonfield will once again be hosting visits from elementary school students as part of the school curriculum on local history. 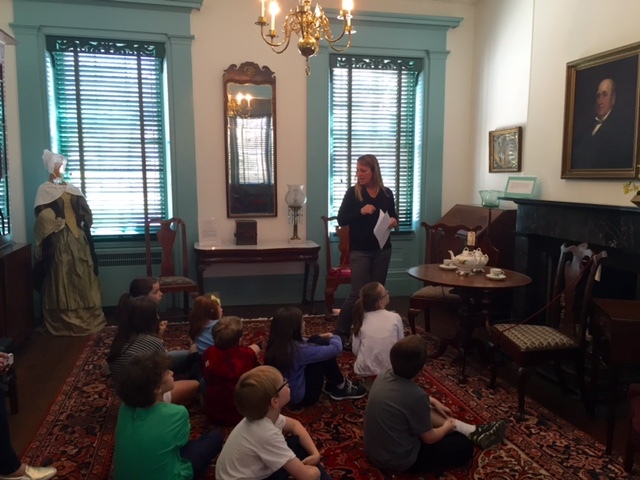 We’re anticipating leading tours for ten classes of second-graders, and we’d love your help either as a lead docent or a helper. Volunteers should be willing to commit to helping with at least two tours of Greenfield Hall in late April and May. The tours will be held from 9:30-11:30 am during the week, and are currently being scheduled with teachers. All volunteer docents are also required to attend a training session at Greenfield Hall on Thursday March 23 from 1-2:30 pm. If you’d like to volunteer but cannot attend training on the 23rd, please let us know. If you’re interested, please RSVP to Marsha Marshall at info@haddonfieldhistory.org. Thank you, and if you have any questions, please contact us at info@haddonfieldhistory.org or 856-429-7375.